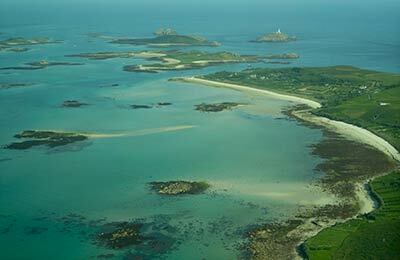 You can use AFerry to book ferries to the Isles of Scilly from the UK. The route is from Penzance in Cornwall to St. Mary's island. The largest island of the Isles of Scilly. Using AFerry you will always get a great deal on your ferry to the Isles of Scilly. See below for timetables and the latest special offers. Booking an Isles of Scilly ferry couldn't be easier with AFerry. You can either use the booking form at the top of the page. Or, if you see a price you like on the left, just select the number of passengers and click go. The Isles of Scilly is the UK's largest archipelago. There are five inhabited islands and 140 islands or so in total. Some of the uninhabited islands can be visited by day boat and some are never visited at all. For many the Isles of Scilly offer a simpler, kinder and more peaceful way of life. About 2,200 live on the Isles. The five inhabited islands are Bryher, Tresco, St. Martin's, St. Agnes and St. Mary's. Famous for its pristine beaches and coastline, its wildlife, history, culture and much more, the Isles of Scilly are well worth a visit at any time of year. And with a daily ferry service from Cornwall with a crossing time from just 2 hours and 45 minutes, it is now easier than ever before. The Atlantic winds and the Gulf Stream have shaped this paradise of crystalline waters, turquoise sea and white fine-grain sand, making of these islands a great destination. The IOS archipelago is composed by five inhabited islands, (St. Mary's, Tresco, St. Martins, Bryher and St. Agnes), and dozens of rocks and islets located on the West of Cornwall's coast. They extend more than 6 square miles surrounded by the Celtic Sea. According to documents from the Roman Empire it seems that at the time the islands constituted a single one. Nowadays when the tide is very low it's possible to walk between some of the islands. On the Three Hundred and Thirty Five Years' War between the Netherlands and the Isles of Scilly not even a single shot was fired. Inhabited since the Stone Age, its people have survived all this centuries thanks to fishing and agriculture. Nowadays the islands still depend on the sea and land, and that is because the flower business (mostly daffodils) and tourism have become the main drive of the local economy. 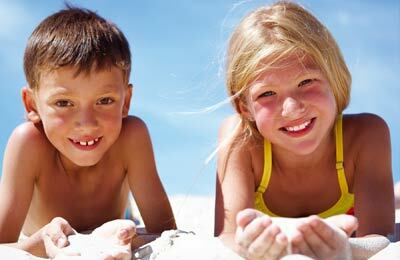 The fun and entertainment are guaranteed whatever you like; long walks on deserted beaches picking up sea shells and having a picnic on the sand, stargazing after a spectacular sunset, go for a swim or watch the dolphins and other wildlife. If what you really like are thrilling experiences, the islands have much to offer to you too, practice horse riding, hire a sail boat and visit all the islands, go kayaking, windsurfing, kite-surfing or rowing, experience a submarine safari, hire a horse-drawn carriage or a motorbike to explore the islands of St. Mary's and Tresco. And don't forget to go snorkelling with the seals! 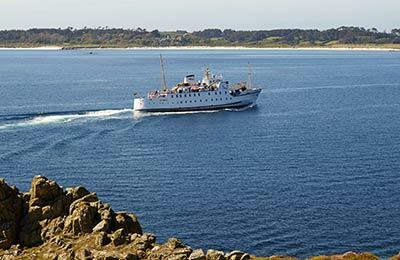 AFerry.co.uk offers the best way to find the cheapest ferry routes to Isles of Scilly with its easy to use booking form. Begin your holiday on a ferry and start relaxing straight away! My only gripe was the chaotic claiming of the luggage on a packed quay side in the lashing rain in the dark. I think the passengers should be kept on board for an extra half hour to allow the containers to be emptied and the cases lined up in a row and some extra lighting on the quay side. I think the price is much too high. For a family of four the price of the ferry is rather stiff - even compared to Norway where I am from. All the staff, including the baggage handlers were friendly and helpful. The boat was comfortable with plenty of choice about where to sit. My only reservation about facilities on board relate to the number of toilets . I we had had a difficult crossing these might not have been sufficient. Catering was adequate.